The Pro Bowl has taken on a distinctly veteran flavor with, from left, Rod Smith, Trent Green, Robbie Tobeck and Larry Allen playing this year. All of them are 35 years old. Hawaii in February never gets old for NFL players ... even though they themselves do. "It's a vacation for me and the family," 34-year-old Cowboys guard Larry Allen said. "It's always wonderful to be here." Today's Pro Bowl is the 10th NFL All-Star game for Allen, who just completed his 12th season in the league, all with Dallas. And the old guard is not the only member of the old guard represented. Reversing a recent trend of younger Pro Bowl rosters, 18 players with at least 10 years in the league will suit up for today's 1 p.m. kickoff. The game is sold out, but will be shown live on ESPN. Eleven from the AFC and seven from the NFC have reached double digits in years of service. Curiously, neither of the kickers -- the players with the most longevity -- are among them. Arizona's Neil Rackers and Cincinnati's Shayne Graham are in their sixth and fifth NFL seasons. The AFC vets are quarterback Trent Green (Chiefs), cornerback Ty Law (Jets), fullback Lorenzo Neal (Chargers), safety John Lynch (Broncos), center Jeff Hartings (Steelers), guard Will Shields (Chiefs), offensive tackle Willie Anderson (Bengals), offensive tackle Jonathan Ogden (Ravens), wide receiver Rod Smith (Broncos), wide receiver Marvin Harrison (Colts) and quarterback Steve McNair (Titans). 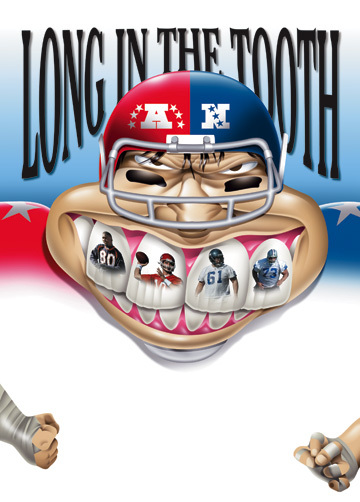 In addition to Allen, the NFC has long snapper Mike Bartrum (Eagles), linebacker Derrick Brooks (Bucs), safety Brian Dawkins (Eagles), defensive end Michael Strahan (Giants), fullback Mack Strong (Seahawks) and center Robbie Tobeck (Seahawks). 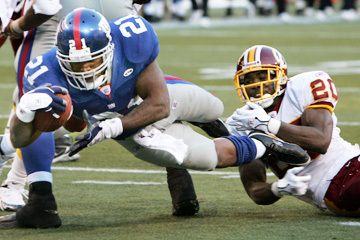 Tiki Barber led the Giants in rushing this past season. Many are familiar names even to casual fans, but Bartrum, Strong and Tobeck are first-time Pro Bowlers. Strong helped pave the way for NFL MVP Shaun Alexander to rush for 1,880 yards and score 28 touchdowns in 2005. The 13-year veteran said he never gave up on the idea of making it to the Pro Bowl. "It's always been in the back of my mind every season, thinking I might accomplish that. To be voted in by your peers, that says a lot," Strong said yesterday. "We had a lot of success as a football team, and that contributed to it, as well. It's something that's always been among my personal goals. For whatever reason, it didn't happen until now. It's great. It's been a great experience. It's been everything I thought it would be." Lynch, another 13-year veteran, is here for his seventh Pro Bowl. He's been coming to the islands for sports even before that, since 1990, when he pitched for Stanford against the University of Hawaii. Now he comes with his family even during years he's not playing in the game. "It never gets old. We get over here twice a year if we can, go see the other islands, tour around," Lynch said. "It's as much a trip to say thank you to them for putting up with me being gone and everything. The aloha spirit's won me over." 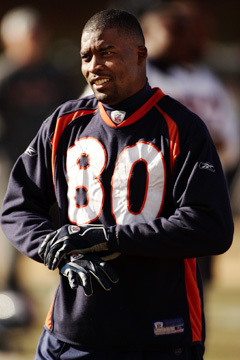 Broncos receiver Rod Smith, who is 35 years old, is playing in his third Pro Bowl. McNair said he had his bags packed, ready to go, when he got a call during the week asking him to replace Denver's Jake Plummer, who pulled out because of injury. McNair, in his 11th year, is excited about the Pro Bowl because he was so banged up the other two he was chosen. In 2000, he had a shoulder injury and didn't play, and in 2003 he started but left after four plays (including a 90-yard touchdown pass) with an ankle injury. "I think it's all about the individual situations people have, whether they want to play in the game or not," McNair said. "A lot of guys take it as a responsibility. But it's also a great opportunity for fun and relaxation, take a little vacation. After a long season, some of us older guys need something like this." Brooks is here for his ninth Pro Bowl in 11 NFL seasons. He said he's been tempted to take the Pro Bowl off because of the wear and tear of the season but always decides to get on the plane to Honolulu. "It used to be guys get hurt and can't come, so you get a younger player here. Now, for the most part, if a veteran guy's healthy he's going to participate. I can say that's been my case. I've been hurt the past few years, but now I'm healthy and participating." Strong came to Hawaii last year to watch the Pro Bowl. "I had a great time and definitely knew I wanted to come back and play in it at some point. I didn't know it would be the next year. Definitely a dream come true." Allen looked around the NFC locker room when asked if he noticed the influx of players approaching the twilights of their NFL careers in this year's Pro Bowl. "That's true, there are a lot of familiar faces around here," he said. In the cases of Strong, Tobeck and Bartrum, familiar, but not in this environment. "I think it's great that some of us guys are getting recognized late in our careers," Strong said. "It shows that it can happen if you just hang in there." 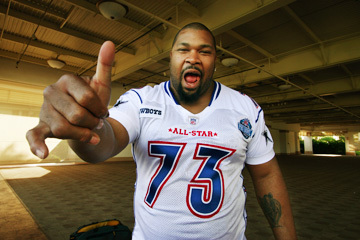 Cowboys guard Larry Allen gave the shaka sign as he walked to the NFC's Pro Bowl practice at the Ihilani last week. Allen is in his 10th Pro Bowl this year.